Looking for a stand-alone Fishfinder? 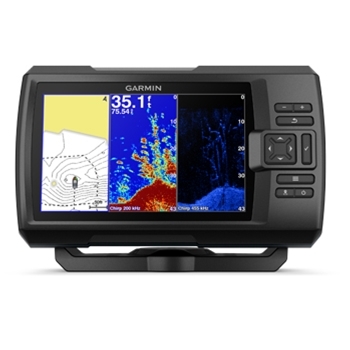 Look no further, Garmin's STRIKER Plus 7cv with GT20- Transom Mount transducer offers a larger 7" sunlight viewable color display, crisp clear images of whats going on below your boat and even an internal GPS for waypoint marking, navigating back and boat speed. Detailed sonar images with the included CV20 transducer. Offering traditional CHIRP Sonar images for exceptional target separation and marking fish. ClearVu CHIRP sonar technology provides near photographic images of structure and bottom below the boat. 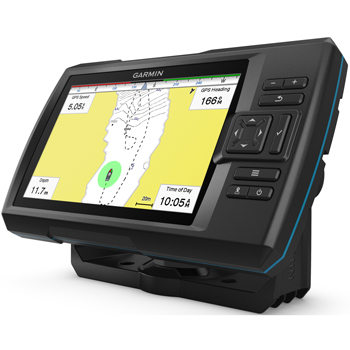 Quickdraw Contours- One of the most talked about features in Garmin's STRIKER Plus fishfinder units is Quickdraw. A FREE, easy to use software that is built into the device that allows the user to create custom HD Fishing maps with 1' contours. While you fish, quickdraw creates your maps and the results appear instantly on your display. No special add-ons or expertise required. You fish - Quickdraw creates. It really is that simple! Plus, these are your maps - share if you wish or keep for yourself, its totally up to you. You can even add labels to your points of interest. Mark and label navaids, brush piles, favorite fishing spots, ramps and more! Built-In Wifi in the STRIKER Plus 7cv allows you to pair with the free all-in-one ActiveCaptain app. Access the quickdraw community for sharing of your maps or downloading of others. Make, save and transfer waypoints between the app and your STRIKER Plus and even receive smart notifications such as calls and texts right on your STRIKER Plus display when paired with the app. Flush Mount your Garmin STRIKER 7 and STRIEKR Plus 7 with this kit. Includes Mounting Template, Hardware and Instructions.